Dental Supersonic Scaler The main character of B5-2 Ultrasonic Scaler is that the handpiece can be detachable and sterilized seperately. 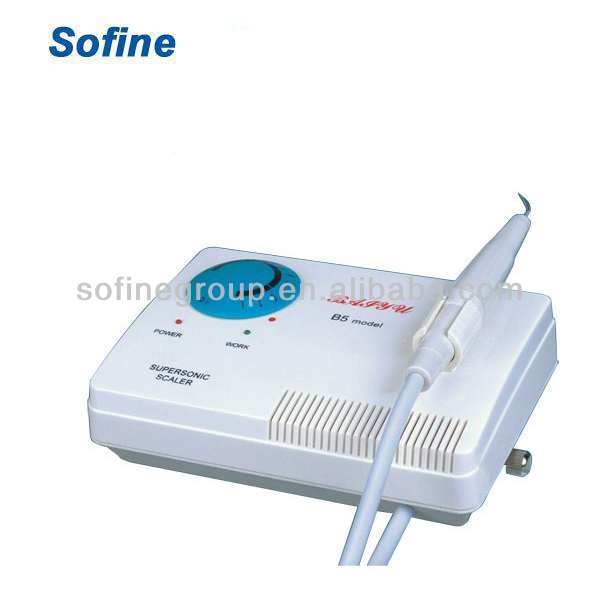 1.Ultrasonic scaler is mainly used to remove dental calculi, tobacco stains, bacterial specks and tea stains. 2.Compared with manual scaling, it has such advantages as less bleeding, high efficiency and no damage to teeth. 3.Therefore, ultrasonic scaler is a kind of indispensable device to prevention and treatment of dental diseases. 4.Ultrasonic scaler ultrasonic scaler is a new product of elaborate designed by our company. 5. The unit adopts fine oscillation circuit (vibration as high as 34.000 times a second) and automatic frequency follow-up, which ensures that transducer is in optimal working state at all times. 6. The transducer, made of titanium alloy, has good performances such as no power diminution, no broken ends and no heating during long-term service. 7.The handpiece cord made of imported silica gel tube, is smooth, flexible and pollution-free, and does not harden as temperature drops. Contact us if you need more details on Dental Supersonic Scaler. We are ready to answer your questions on packaging, logistics, certification or any other aspects about Dental Supersonic Scaler、Dental Supersonic Scaler. If these products fail to match your need, please contact us and we would like to provide relevant information.